Inventors of a new system to build roads made of plastic are hoping to test the first prototype by the end of 2017. 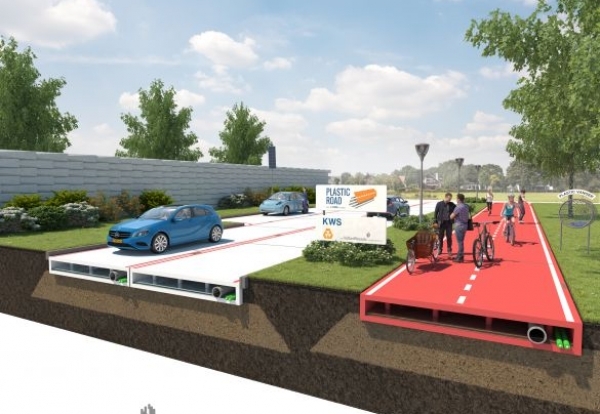 VolkerWessels subsidiary KWS first unveiled the PlasticRoad concept last year as a sustainable alternative to traditional asphalt construction. KWS has now been joined by plastic pipe specialist Wavin and bitumen giant Total. The PlasticRoad concept involves recycling plastic waste into lightweight modules with hollow interiors that can be fitted with cables and plastic pipes and allow excess water to drain. The pre-fabricated units will be easy to transport, assemble and maintain, and the lighter weight means the ground will be less prone to subsidence. Anne Koudstaal and Simon Jorritsma, the inventors of PlasticRoad, said: “Together with Wavin and Total, we now have a vast pool of knowledge, experience and resources, and can take concrete steps in the development of PlasticRoad. Jan Willem Viets, Director of Wavin Nederland, added: “Being part of the development of PlasticRoad fits in the strategy of Wavin to provide innovative plastic solutions for the building industry. Xavier Bontemps, Senior Vice President for Total’s Polymers Business Unit, said: “We are delighted to be working on this promising flagship project and to share our expertise in polymer solutions and recycling processes.